Here's where you can extend patio season: Fire pits, domes and retractable roofs: These restaurants and bars want you to continue dining and drinking alfresco. 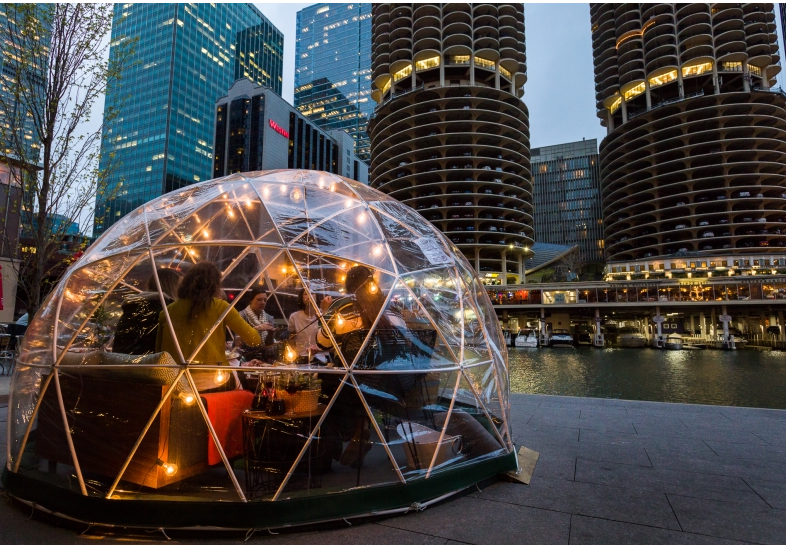 This year, Tiny Tapp and Cafe is getting in the game with a "transparent insulated tent," Set to open Oct. 22, the tent can fit up to 120 people, while still allowing for impressive views of the Chicago River. Chicago Tourist Traps We Secretly Love - These trendy, touristy things to do are popular for a reason. They’re part of what makes Chicago so great, and we’d be lying if we said we don’t enjoy a trip or two every year to these iconic locations. #ChiStories Podcast: Tiny Tapp and Chicago’s Craft Cocktails Scene - Who’s got more Chicago Stories than your local bartender? This week on the Chicago Stories podcast, Mayor Emanuel chats with Chicago local Mark William Johnson, partner of Tiny Tapp & Cafe located on the revitalized Chicago Riverwalk. Relax by the River at Tiny Tapp. Enjoy frozen drinks, sharable snacks, and ice cream at this breezy spot on 55 W. Riverwalk South. The Chicago River-156 miles of connected waterways-is what made Chicago a historically important location. So it's natural that it's a great way to experience the city's culture and history today. The Riverwalk, also known as the city's "Second Lakefront," is home to delicious restaurants, recreational activities like boat rentals and water tours, and gorgeous viewpoints. This past Thursday, I stumbled upon a bar on the Riverwalk called Tiny Tapp. Trust me when I say there is nothing tiny about this gem. Whether you’re just chillin’ at the bar to do some afternoon work or spending the night letting loose with your bae, it’s never a good idea to drink on an empty stomach. And, while you may think that the pizza you had three hours ago is sure to hold you over, you’re bound to get those cravings halfway through the night.